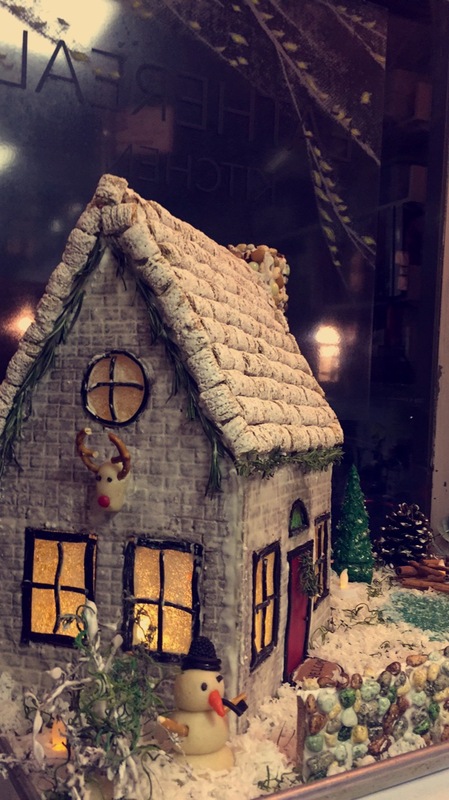 The only other gingerbread house I've ever made was almost a decade ago, about 4 months before enrolling in culinary school. It came out perfect - a little blue clapboard house with a sliced almond roof and a little snow covered log pile. Even I was amazed at what came out of it and I’ve been toying with the idea of going again ever since. Having done it once, I was wary of the commitment and the intensity of the project. But this year Leah and I wanted to do a creative project together to celebrate the season and the fact that we’ve been crafting together for 25+ years so it seemed like the right time. Turns out we had a very similar vision of what we would like to make and off we went. We began with a quick template made by my dad and I hit the web to research structural gingerbread recipes. I found this terrific article on Serious Eats which was not only incredibly informative, it also confirmed the lessons I learned the first time around so this years would be bigger and better. After all, we do run a catering company! Below are my reflections and feedback on this terrifically helpful article. I hope it inspires you to get off the fence and do it! Strong dough. This recipe is great but if using another, look for ones that avoid the molasses. If your an inexperienced baker or gingerbread maker, make your dough ¼” thick (slightly thicker than the blogs advise but it’s for your own protection). Hard cuts. Press down thoroughly when outlining your pieces. Do it again right before they go in and again when it comes out. Gingerbread reseals as it cooks so you want to make them count. If laying a brick pattern (ours was 1” x 1cm), you want to almost cut through your dough entirely if you want it to show. You only get one shot so make it count. If you want to light it internally (ours has battery powered LED fairy lights and LED votives throughout the yard), make sure you leave yourself a trap door to get stuff in and out. Royal icing - ratio is 1:4, BY WEIGHT not volume, egg whites to confectioners sugar. You want it thicker for structural elements like assembly or roof shingling and creating decorating volume. Its a real pain in the tuchus to thicken royal icing back, it takes a shocking amount of additional sugar, so thin it slowly by adding drops at a time and mixing real well. Directions: Using a mixer on low speed, combine the egg whites and half of the sugar until blended. Then kick it up to medium and sprinkle in the remaining sugar until your get a sandy texture (drop and scrape the bottom of the bowl to make sure everything is getting incorporated properly). Add a few drops of water with the mixer running until the icing starts to clump a little (it should bind together when touched like dough). Gather the icing up into a ball just like dough and wrap it well in saran. It will keep for a week at least at room temperature with no air exposure. You can break it off into smaller pieces for different projects and colors and adjust your thickness by adding water. Decor - After you have a direction and a general game plan, the sky’s the limit. Roll with it and good ideas and solutions will come up in the process. Leah and I wanted a stone chimney to go with our country cottage so we hit up the candy store and found jelly beans, chocolate covered espresso beans and candy covered chocolate rocks in our color scheme to make it come to life. They also had a bag of candy pumpkins for $1 so now we have a pumpkin patch out back and a carrot nose for our snowman. We used the licorice whips that outline the windows on the doormat and Frosty’s pipe and hat. Leftover scraps became a stonewalled gate.We had tons of frosted wheat and dried royal icing crumbles all over a sheet tray that then ended up getting sprinkled on our trees to give them a realistic effect. Leah used a sharpie to write directly on the gingerbread for our doormat and signs. Our royal icing schmears inside the house ended up looking like intentionally snow frosted windows. We saw an adorable outdoor fire made with pretzel sticks and jelly candies but made ours with cinnamon sticks and another LED votive. I could go on and on forever but you get the drift. Making the gingerbread house brought tremendous joy and we hope you enjoy our photos and then try making your own! Best wishes for a delightful holiday season and a happy 2018!